Cantina di Colognola Ai Colli: Colognola Ai Colli Lugana D.O.C. Bianco Colognola Ai Colli Lugana D.O.C. Bianco: �Luminous straw yellow with green reflections in the glass. 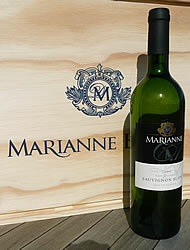 Aromatic, delicate bouquet of juicy, fresh fruits (lemon, grapefruit) combined with floral notes. On the palate, the aromas are reflected again and the Colognola Ai Colli Lugana captivates with fresh, fruity taste, well integrated fresh acidity and a mild, pleasant finish. https://www.weinbaule.de/white-wine-italy-colognola-colli-lugana-doc-bianco-p-2724.html?osCsid=a65f7ce4fca833f7f1040251ac5d8021"> Wine 8.98 WeinBaule.de | The Home of Wine Cantina di Colognola Ai Colli New In stock!